Number of inhabitants (1 Jan 2003): 10.507; area: 44,36 km². Settlements: Herkenbosch (seat), Melick, Vlodrop. The municipality of Roerdalen was formed on 1 Jan 1991, after the merger of the former municipalities of Melick en Herkenbosch, and Vlodrop. 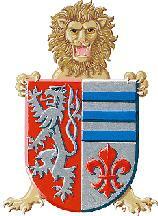 Until 1 Jan 1993 the new municipality was named Melick en Herkenbosch. The new flag, adopted 1 Jan 1991, in the colors red, white, and blue, symbolizes the unification of the two former municipalities by the Roer-river. The same river played a major rôle in the flags of the former municipalities of Vlodrop and Melick en Herkenbosch. Design of flag and CoA: Stichting voor Banistiek en Heraldiek. from the Roerdalen municipal site. Granted 21 Aug 1991; the left part with the double-tailed lion is from Melick en Herkenbosch; the right part from Vlodrop.